The Auburn Tigers were a tough team to figure out at times during the regular season, but there’s no denying this is one of the more dangerous teams in the nation when they get their ground game rolling. Auburn had some up and down results this year standing 8-4 overall and in their regular season finale the Tigers fell to rival Alabama on the road by a final of 12-30. Auburn leaned heavily on their ground game as this squad ranks 6th in the nation in rushing compared to 112th in passing. On the other side of the ball Auburn ranks 21st in the nation in total defense. QB Sean White stepped up to take control of the starting job and on the year the veteran has thrown for just 1,644 yards and 9 TDs to 3 INTs. The ground game has a number of strong options and it’s been Kamryn Pettway who’s led the way putting up 1,123 yards and 7 TDs. The Oklahoma Sooners only defeats this year came out of conference against the likes of Houston and Ohio State back in the September and it’ll be interesting to see how the Sooners fair here as they take on an SEC opponent. Not an ideal bowl matchup for the Big 12 champs who’ve found a lot of success over the past few months winning 9 straight to stand 10-2 overall. 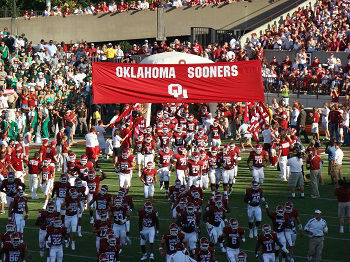 In their last outing Oklahoma looked great against rival Oklahoma State picking up the win by a final of 38-20. There’s no hiding the shortcomings of this Oklahoma defense as this group ranks 89th in the nation in total defense compared to 3rd in offensive production. The Sooners can light up the stat column and on the year QB Baker Mayfield has thrown for 3,669 yards and 38 TDs to 8 INTs, while Mixon and Perine both gained about 1,000 yards on the ground. We’ve been cautious with this Oklahoma squad throughout the regular season given their defensive struggles and it’ll be interesting to see how the Sooners are able to handle this elite Auburn ground attack. Oklahoma could also be lacking motivation coming into this particular bowl matchup given they’re going against a 4 loss opponent after winning the Big 12 title. We like Auburn to push the Sooners as the Tigers go on to cover the spread. View All Today's Free NCAAF Picks By Clicking Here! The Sooners enter the Superdome riding a nine-game winning streak and look to topple their third consecutive ranked opponent following lopsided wins against West Virginia and Oklahoma State.